Sand Hills, Saskatchewan, is a region of the prairies that is unique, an expanse of shifting sand dunes interrupted by patches of green vegetation, small lakes, and saline flats. Foreign yet familiar, Sand Hills is the extraordinarily vivid place threaded through Jacqueline Baker’s highly praised first collection of short fiction, eight fresh and true stories of prairie life. 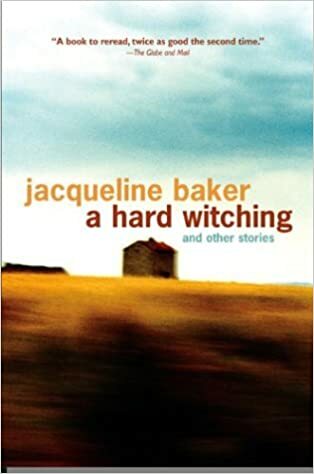 Baker writes with confidence and unvarnished honesty, and like Flannery O’Connor or Bonnie Burnard, she has the rare ability to make the familiar brilliant and finely understood. Hers are universal themes of the tensionsof family life, of relationships defined by what isn’t said, rather than what is, and of our connection to a past that may be real or imagined. Reading A Hard Witching is like entering a complete and perfectly detailed world with each story—worlds that are not easy to leave and even harder to forget.